When my children were small, we would celebrate the 4th of July with my parents on Cape Cod. They owned a beautiful home right on the Bass River in South Dennis. We have many memories of the time spent there, especially July 4th, which was my Dad’s birthday. We would spend many lazy summer days either watching boats going up and down the river or on my Dad’s boat. It was a wonderful time we shared together with our family. A time filled with many stories that we still talk about years later. How I long for those fun filled days now. It’s been 14 years since my Dad passed away and my Mom sold their beloved house. On my kitchen table I have created a nautical 4th of July vignette. It’s a small reminder of the celebrations we would have on Cape Cod. My display works perfectly in this antique white round wicker tray. I love the leather handles on the piece. They contrast nicely with the wicker and work with the theme of the vignette. I used red white and blue sailboats in the design for a full nautical 4th of July effect. Small tidbit dishes are stacked on the tray at different heights. I placed the red sailboat on one of the stacks. I like how it’s height gives the vignette an interesting perspective. Two small American flags are set into the red pitcher that also holds flatware with white handles. There’s a nice contrast between the red and white. The small bird salt and pepper shakers are still on the table where they belong, just under glass cloches with rope handles this time. I stacked small blue star dishes and added a few shells in the top dish. More sea shells are scattered on the bottom of the tray and also found in the red flower shaped dish. 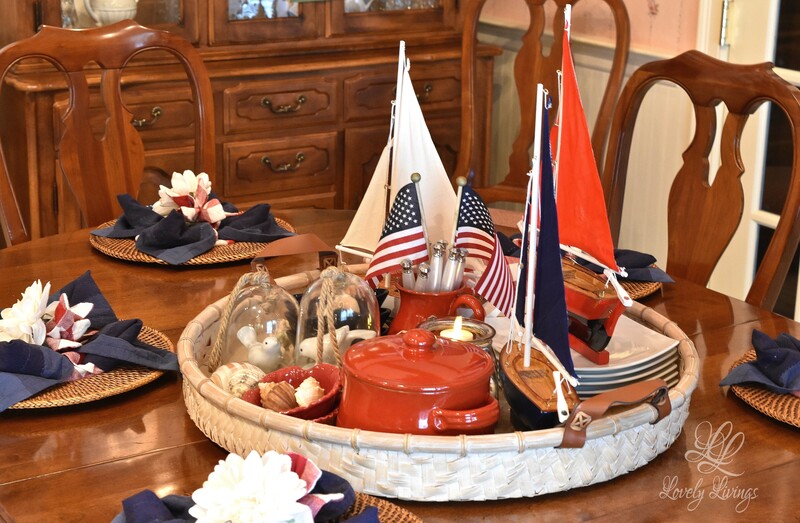 I hope you enjoyed my “Nautical July 4th table vignette” post! Feel free to pin my design idea onto your Pinterest boards. Hi Cindy! I’m happy you enjoyed my post. Thanks for your lovely comments! Lovely vignette…perfect for the holiday. Those boats are divine! Thanks Bev! Can you believe that the 4th is almost here! I’m happy you like my vignette. I love red, white, and blue and you did an amazing job with those colors! I appreciate your lovely comments Donna! Thanks for stopping by to visit! Very cute vignette! I love nautical things and mixing them with a patriotic theme seems to work so well! The time you spent in Cape Cod sound wonderful. It’s a blessing that you have those precious memories to hold onto. Thank you Liz! The time on Cape Cod was wonderful! I’m so grateful that we were able to spend summers there. It was a blessing! I wish my mom kept her house, but it was much to hard for her to do so. How fun!!! I love your table and what it represents. We used to spend 4th of July on the Cape, at Centerville! I will be looking forward to the baked bean recipe! Hi J! I do miss summers on the Cape! Centerville was only about 20 min. away from us! Small world! I’ll be baking my baked bean recipe this weekend and will post it on Monday. I just need to get pancetta and more dijon mustard for the recipe. What a beautiful table setting for the 4th of July, I will watch for the baked bean recipe. Thanks for sharing on #OMHGFF this week! I hope you enjoy the 4th Celebration! LuAnn, I love the vignette! The wicker tray just says summer, and anything nautical is a winner with me. Your memories of shared family times on the river sound wonderful—I know how bittersweet those memories can be, but blessed we had them. I collect nautical inspired pieces for tablescaping and patio décor. I have my Mom’s 52 year old ” Man of the Sea” cast iron bookends that bring back so many great memories of days gone by. Hope you have a wonderful 4th. Did you guys get that storm last week? It was a doozy here—lots of downed trees. Luckily, no trees down nor power outages in our neighborhood, and the predicted tornado never came to be, thank goodness. I lived through one in Ohio and don’t have any desire to do that ever again. Thanks Bobbi! We have a lot of memories for sure. To bad my son, Joe, who’s 13 never saw the house. He would have loved it! It’s funny how Joey resembles my Dad a lot. Strange how life is. We did get the storm, but not as bad. Heavy rain and wind though…got very dark here when it hit. Tornado watches were for the upper northern part of our state though…I can’t imagine going through a tornado and I never want too! I hope you have a happy 4th too! Came quick! Maybe the weather will be nice this year and not like last year. Thanks for sharing your fun 4th tablescape at my Show and Share party…love those cute sailboats. Lovely! The nautical red, white and blue theme is timeless! You’ve given me lots of ideas, thank you! Love this display and the fond memories that it brings to you and your family! The boats are wonderful and I love it corralled in the wicker tray! Thanks for sharing with SYC. Popped over to this post from your sidebar. Your beautiful red, white, and blue table caught my eye. Love the nautical theme.